macaroni & cheese: Christmas Gift: The King of Bollywood!!! 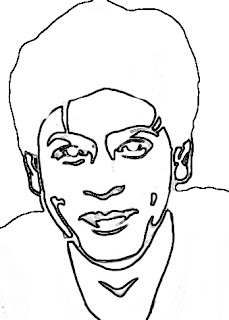 Christmas Gift: The King of Bollywood!!! One of my friends is THE most devout fan of Bollywood films ever, and her true love (second to her hubby, of course) is Shahrukh Khan. 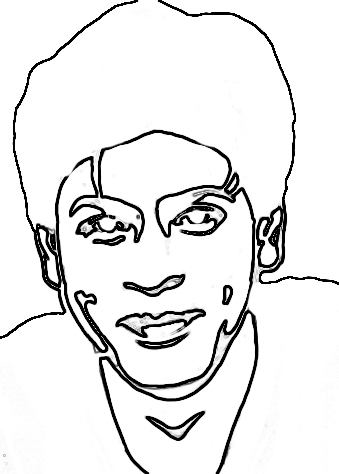 So, I whipped up a pillow cover for her, and stenciled on her The King of Bollywood. A freezer paper stencil, of course. Me and the xacto knife go way back. And, I used glittery black paint. Plain paint would NOT do for such a SUPER STAR! Envelope opening, so my friend can machine-wash her slobber off of the pillow. And, the stencil. My daughter did the transfer of the photo to this and then I printed it out on freezer paper. Here's an easy tutorial on how to make a freezer paper stencil. Ssssseeexxxxxxxyyyy! Now, go Bollywood-Super-Star up all of your stuff... Leave no surface untouched! Ooooh I even got a small mention!